Being a male in his early-20s, I spent much of the years 1999 to 2003 proselytising about the merits of The Matrix. As time has gone on, and sequels to that film have been released and polluted its memory, I've increasingly found myself at odds with my earlier opinions about it. As I've aged, I've started to question whether or not its Fauxdrillardian (one for my post-modernism peeps out there) philosophical musings were of any real substance, and whether it was just a pile of pretension built around some admittedly amazing action sequences. The reason I mention this is that I can say with some conviction that Dark City, Alex Proyas' neo-noir masterpiece, is the film that The Matrix wishes it was. Dark City is a triumph of visual design. Proyas, who has since gone on to direct such high-concept, low-quality, big-budget tripe as I, Robot and Knowing, imbues every frame with more visual imagination than most directors fit into entire careers. It takes place in a city that is controlled by The Strangers, a group of grey-faced monsters with psychic abilities who are able to change the nature of reality. Unbeknownst to its citizens, every night the Strangers alter the shape of the city, the composition of its skyline, the order of its streets, and the very nature of its people by altering their memories. One such inhabitant is John Murdoch (Rufus Sewell), who wakes up to discover that he has been missing for three weeks and is being hunted as the lead suspect in a series of grisly murders. As Murdoch tries to unravel the mystery of his own life, he finds himself coming into contact with Dr. Shreber (Kiefer Sutherland), a psychiatrist who seems to have an intimate knowledge of The Strangers, and that he is being pursued by Inspector Frank Bumstead (William Hurt), a dogged policeman who finds something fascinating about John's case. Thanks to the ever-shifting nature of the city, Proyas and his production designers are given free reign to mash together buildings, devices and vehicles from many different periods. The different styles exist at the same time, creating a disorientating world in which nothing is ever certain, not even memories. In much the same way as it combines visual sensibilities the film combines the genres of science fiction and film noir. As we follow John through the maze of his mind and his city, we are drawn into his paranoia. The Gothic design of the world perfectly compliments Murdoch's search for himself; they form a maze, a collection of claustrophobic passages and towering buildings that obfuscate the nature of the world, in much the same way Murdoch's past has been obfuscated by The Strangers. As the story progresses, we learn that John has somehow developed the same abilities as The Strangers, and that he is able to bend reality to his whims. This does make for one of my minor gripes with the film, that the way in which psychic powers are demonstrated is through having the air blur in a funnel shape. It's a bit distracting, and just serves to underline how little cinematic potential there is where psychics are concerned, but once you've acclimatised to the effect it really doesn't matter. 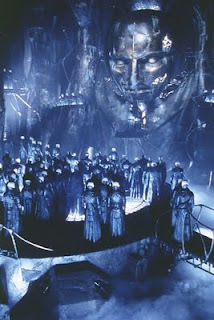 Philosophically, Dark City represents a literalisation of Last Thursdayism, the notion that for all we know the world might have been created at any term, as early as last Thursday, and that we would be unaware of this because the world would have been created to seem like a much older world. It's an idea that has always fascinated me (or has? Have I always been fascinated by the idea, or do I only remember being fascinated but did not exist until last Thursday?) so I pretty much instantly got on board with the ideas of the film. The Strangers' experimentation with transplanting memories, instantly changing their lives in an instance, questions the very nature of humanity. Are we merely the product of our memories, or is there some fundamental part of us, some soul, that truly defines who we are. The film is suffused with an existential dread that enhances the already impressive designs of the world, creating an holistic view that is exhilarating, both on a visual level and an intellectual one. If you are going to watch any version of the film, I would recommend tracking down the Director's Cut, for no other reason than it cuts out the studio-imposed opening narration, which ruins some of the plot twists.